OMG this recipe is a must make. It is a Bobby Flay recipe that I changed just a little but his salad dressing is a do not touch delicious. Put all the dressing ingredients into a blender and swirl till smooth. Bake till the tops start to brown then turn over to brown the other side. Place the potatoes on a paper towel to drain any oil. Take one tablespoon of goat cheese and spread it on each potato. Put the potatoes back in the oven and melt the cheese just a little. Take out and drizzle with the dressing and the chives. I served these on a bed of greens. I also didn’t have any chives so I diced up a red onion. Bobby Flay made beautiful potato stacks but these are open face so I can eat more. I saw these on TV and had to make them. One tablespoon apple cider or malt vinegar per potato. Place them in a pot with water and 3 tablespoons salt. Boil the potatoes till they are fork tender. Put the canola oil in the bottom of a cookie sheet. Place the potatoes on the pan and coat them with the oil. With the bottom of a glass, press down on the potatoes till they are about 1/2 inch thick. They aren’t very pretty but cute. Sprinkle with salt and pepper and bake for ten to fifteen minutes. 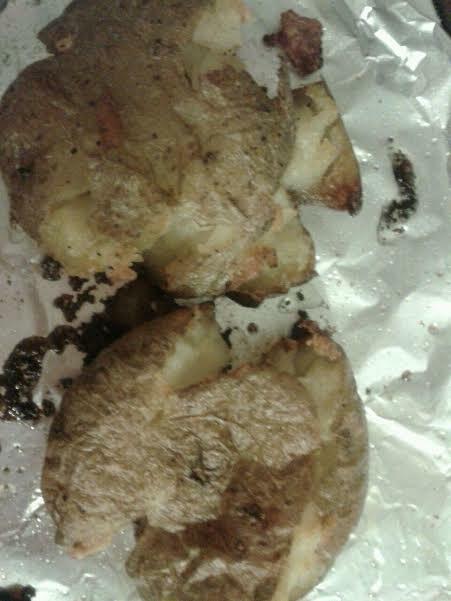 Take out of the oven and turn the potatoes over. Bake in the oven until the potatoes are crisp. Serve with ketchup, hot sauce or even sour cream. The vinegar really adds a great taste to the potato. I served these as a side dish. Next time I make them I would add some fresh parsley, minced garlic, sliced scallions, a little more vinegar . Maybe a squeeze of lemon or some lemon zest would be nice. This would be a delicious warm potato salad. Great for the summer because there isn’t any mayonnaise. Great for the waistline because there isn’t any mayonnaise.